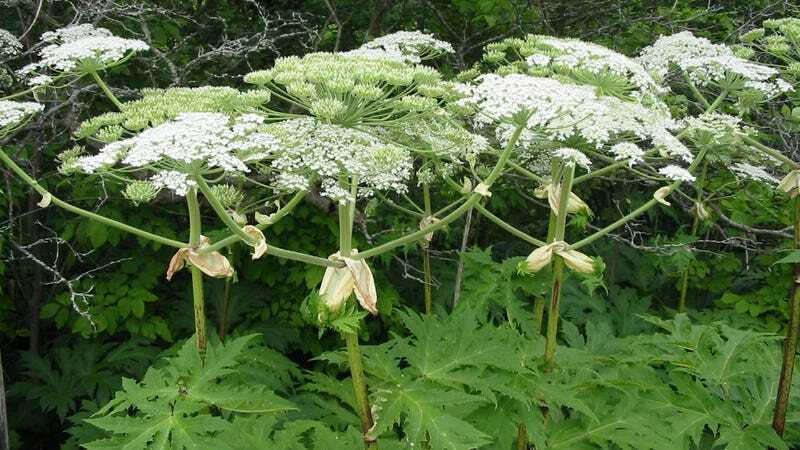 The Giant hogweed, a long-stemmed plant originally from Central Asia, is currently spreading like wildfire around certain parts of the United States and Canada. Not only is it drowning out the local flora, it's also a noxious weed that, when touched, can cause blisters, long-lasting scars — and even blindness. Southern Ontario is being hit particularly hard this summer by the Giant hogweed, which is where I live. Over the past several years, I have seen the forested ravine behind my house get progressively inundated by these imposing plants. Certain areas, particularly those along the 16 Mile Creek, have been completely overtaken. Giant hogweed spreads extremely quickly, and it's particularly fond of growing along roadsides, ditches, and streams. It has been known to invade oil fields and native habitats such as open woodlands. Each plant can produce up to 120,000 winged seeds. Those that fall into the water can move long distances via ditches and streams. Evidence suggests that Giant hogweed is shading out native plants, and because it prefers wetland areas, it's causing rocks, soil, and other material on stream banks to fall into streams. This threatens salmon spawning sites. reported (in the media and by various web sites) to cause temporary or permanent blindness. However, evidence of permanent blindness linked to exposure to Giant hogweed cannot be substantiated by any existing research. Coming in contact with Cow parsnip and Wild parsnip can cause similar reactions. Currently, many jurisdictions are working to prevent its spread, but from what I can see in my neighborhood, it's already a lost cause.